Sound like an advertisement you’d respond to? The reality is so clearly painted in the ad it makes us cringe: hazardous journey, bitter cold, complete darkness, constant danger, return doubtful. Yikes! No thank you. But wait, what’s that at the end? Honor and recognition in case of success. That sounds good. If I – if we – survive: honor and recognition. Wow! Now that’s something I want. Sir Ernest Henry Shackleton was a polar explorer who led three British expeditions to the Antarctic. He is one of the principal figures of the period known as the Heroic Age of Antarctic Exploration in 1901. This was his advertisement to recruit men for the journey. And you know what? It worked! Not only did it give Shackleton the right crewmembers to reach the Antarctic, it enabled them to survive. In his first expedition with men who served with him as a result of this newspaper advertisement, hazardous was exactly how the trip went. 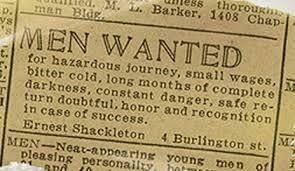 You know what is absolutely remarkable about Shackleton’s expedition? Not one member of the expedition died. Everyone survived! Every single crewmember lived and returned home. 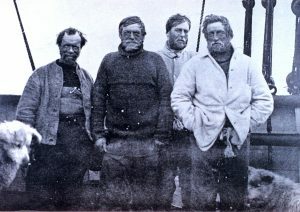 You see, when they turned up to serve on Shackleton’s journey, the end game was crystal clear in their mind. They knew exactly what lie ahead of them on their way to recognition and honor. They knew it was unlikely they make it back. They knew the reality. But they had what others didn’t. They had heart. And therein lies the secret to hiring crewmembers who will survive against all odds: radical honesty. You see, Shackleton knew he would never be able to find the crewmen he needed. Instead, he decided to attract them. And it worked! You know what else Shackleton knew? He knew and embraced that skills can be learned, but heart cannot be taught. He could have trained men in the tasks needed to complete the journey to Antarctica. But he never could have given them passion, drive, and heart to make it there and back to tell the whole world; to do what no one had ever done before. So, #DisasterRestorationBusinessOwner, what if you were radically honest when hiring? What if you hired for heart, knowing skills can be learned but passion can’t be? How would that change your company? You know what? This ad works! I’ve had clients use this exact ad in private job forums and it has resulted in good hires that are still with them. Still not sure you feel like being that radically honest? How about using this ad for a technician in a public social media forum? You know what? This ad works too! I’ve had clients use this exact ad in public forums and it has resulted in good hires that are still with them. Know what else? Their employees see it in the public forum and feel an extra sense of pride and camaraderie, and their work improves! Now imagine a person shows up at your company as a result of these advertisements. In other words, they are attracted to you. They found you. Something in the ad called to them. Now is the time to discover if they have heart. What is it about the advertisement that caused you to come in and apply? Tell me about a time you did manual labor in your life. What did you enjoy most about it? What disaster have you had in your own life? What did that experience make you think and feel? What did you learn? Tell me about a time you helped someone else in a larger than life kind of way, at the expense of yourself. What caused you to help? Imagine your dream job. What impact, result, or contribution would it make to the world? You know what? These questions work! They reveal heart. You can teach anyone with heart the skills they need to do the job because they care enough to learn them. You cannot ever teach heart to a person. Hire for heart. It is these people who will give their all and come back alive on the hazardous journey of disaster restoration. Need help recruiting and hiring the right team members for your DR company? Your time is valuable. We can help.